Last year International Developed Stocks and International Emerging Stocks outperformed US Large Stocks. Year-to-date US Stocks are outperforming International Stocks. For the 10 year period from 2000–2009 the S&P 500 lost -9.10%. International investments logged significant gains during this period. 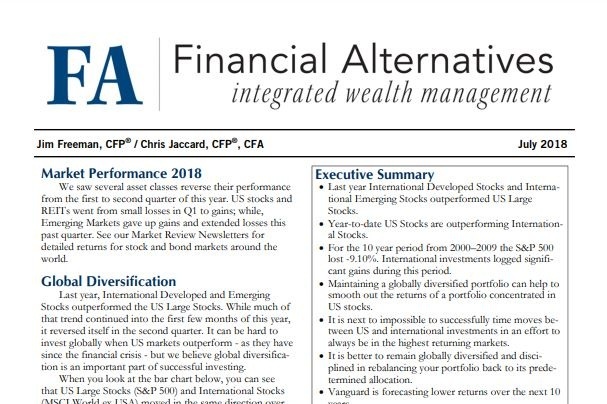 Maintaining a globally diversified portfolio can help to smooth out the returns of a portfolio concentrated in US stocks. It is next to impossible to successfully time moves between US and international investments in an effort to always be in the highest returning markets. It is better to remain globally diversified and disciplined in rebalancing your portfolio back to its predetermined allocation. Vanguard is forecasting lower returns over the next 10 years. Avoiding the Web Can Be Bad For Your Financial Health!